"Pepper-crusted steak, grill-charred vegetables, and sesame-ginger dressing turn fresh salad greens into an exciting main course." Blend soy sauce, vinegar, brown sugar, sesame oil, garlic, and ginger together in a blender or food processor until dressing is smooth. Press peppercorns into both sides of steak and season with salt. Place steak, scallions, and red bell pepper on the preheated grill and cook for 4 minutes. Flip and cook until vegetables are charred and steak is cooked to desired doneness, about 4 minutes more. Let steak rest on a work surface for 5 minutes before thinly slicing along the grain. Cut scallions into 1-inch pieces and bell pepper lengthwise into strips. Toss curly endive and radicchio with the dressing in a bowl; transfer to a platter and top with steak and vegetables. Any variety of salad greens, such as escarole or watercress, can be used in place of the curly endive an radicchio. 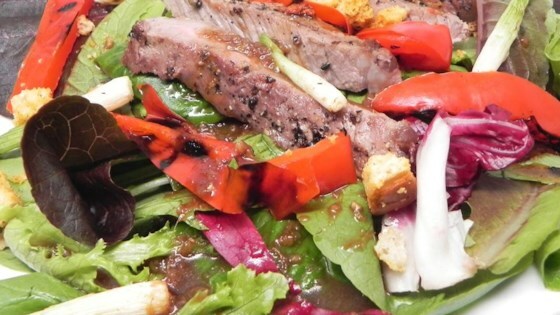 The dressing was too strong and overpowered the steak. I might make a version of this but not with that dressing. Delicious! I also grilled a zucchini and then sliced it on the salad. Didn't have any green onions, so I grilled a white onion in a basket on the grill. Very good!